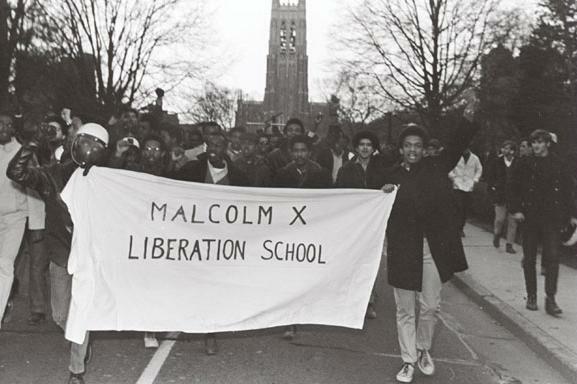 The Department of African & African American Studies at Duke will host a commemoration honoring the courage of the black alumni (1969-1972) who challenged the university's discriminatory policies as undergraduates by "taking over" the university's main administrative building on Feb. 13, 1969. 12:30 - 5 PM Panel Discussions: Original protesters from the 1969 Allen Building Takeover tell their stories, followed by an intergenerational conversation. VENUE CHANGE: Panel discussions to be held in the Ambassador Ballroom at the Washington Duke Inn. 5 - 7 PM: Public Reception to be held at the Nasher Museum of Art. This event is co-sponsored by the Office of the President, the Office of the Provost, Trinity College of Arts & Sciences, Duke Alumni Affairs, the Duke Black Alumni Association, the Duke Council on Race and Ethnicity, the Mary Lou Williams Center for Black Culture and Duke University Archives.